While visiting in Italy Bell and Baldwin met with Enrico Forlanini, the man who had invented the hydrofoil. For many years Bell had been interested in designing a watercraft, and his meeting with Forlanini made him want to go home and build one of his own. That's what they did. They built a hydrofoil and named it HD for "hydrodome". The first one glided across the water at 30 mph, then later they developed one that would go 50 mph and finally by the time they got to HD4 they were going 70.86 mph! 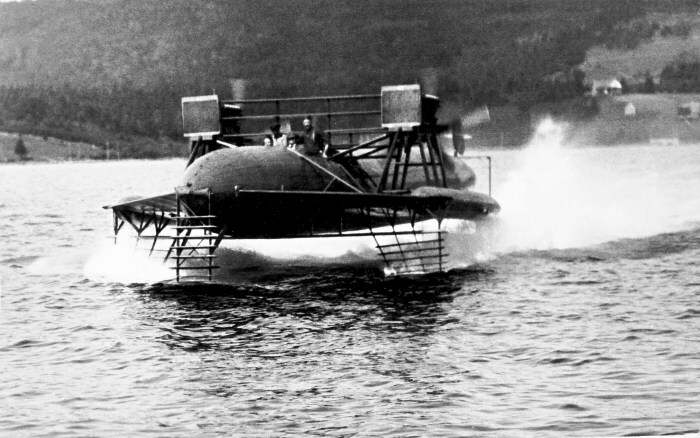 It was the fastest hydrofoil in the world, and that record would stand for ten years. Bell became very ill and passed away on August 2, 1922. He was seventy-five years old. Garden of Praise has been granted permission to present these images for your benefit. Please do not copy or use them without permission . You can contact the Parks Canada Agency for permissions.